She had weedy hair of that vague color which is neither brown nor blond, that hasn't enough life in it to be ginger, and isn't clean enough to be gray. I looked at the ornaments on the desk. Everything standard and all copper. A copper lamp, pen set and pencil tray, a glass and copper ashtray with a copper elephant on the rim, a copper letter opener, a copper thermos bottle on a copper tray, copper corners on the blotter holder. There was a spray of almost copper-colored sweet peas in a copper vase. It seemed like a lot of copper. I pushed out of the booth and lit a cigarette with thick awkward fingers. I went back along the store. The druggist was alone now. He was sharpening a pencil with a small knife, very intent, frowning. "That's a nice sharp pencil you have there," I told him. He looked up, surprised, The girls at the pinball machine looked at me, surprised. I went over and looked at myself in the mirror behind the counter. I looked surprised. I sat down on the edge of a deep soft chair and looked at Mrs. Regan. She was worth a stare. She was trouble. She was stretched out on a modernistic chaise-lounge with her slippers off, so I stared at her legs in the sheerest silk stockings. They seemed to be arranged to stare at. They were visible to the knee and one of them well beyond. The knees were dimpled, not bony and sharp. The calves were beautiful, the ankles long and slim and with enough melodic line for a tone poem. 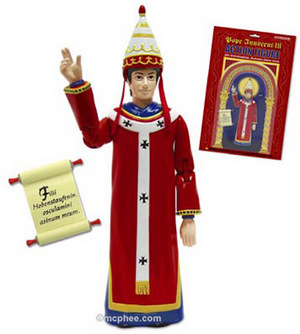 Introduce this Pope Innocent III Action Figure to your other figures and watch the spiritual sparks fly! Armed with his formidable power of excommunication and an intimidating scroll inscribed with Latin text, this 6" tall, hard plastic model of the 176th Pope will soon have all your other action figures lining up for confession. Read the back of the illustrated blistercard and you'll find that Pope Innocent III was a good guy in all respects. He was a patron of the arts, cared about orphans, built a hospital and reunified the Papal States! Comes with removable fancy Pope hat. It's available at Archie McPhee -- Outfitters Of Popular Culture. Buy one -- Deus Volt! "I don't like your manner," Kingsley said in a voice you could have cracked a Brazil nut on. "That's all right," I said. "I'm not selling it." "I'll give you exactly three minutes. God knows why." He burned the carpet back past Miss Fromsett's desk to his door, yanked it open and lit it swing to in my face. Miss Fromsett liked that too, but I thought there was a little sly laughter behind her eyes now. A neat little blonde sat off in a far corner at a small PBX, behind a railing and well out of harm's way. At a flat desk in line with the doors was a tall, lean, dark-haired lovely whose name, according to the tilted embossed plaque on her desk, was Miss Adrienne Fromsett. Hugh Hewitt reported some time ago that a senior Los Angeles Times writer confided his worst fear was he would get "blogged," i.e. file a sloppy story and have it (and his reputation) torn apart by a blogswarm. That is what is happening to LAT reporter Eric Slater over his recent story on the allegedly bacchanalian goings-on at Chico State. The Chico Enterprise-Record has turned up numerous errors, and it now appears Slater may have made up the story from whole cloth. As Local Liberty Blog observes today, Slater could turn out to be the LAT's Jayson Blair. Slater has been suspended, and the LAT has sent another reporter to Chico to investigate Slater's investigation (sort of like a journalistic Internal Affairs Bureau). LAObserved, Local Liberty Blog and Patterico provide good coverage of the story and are good destinations to find all the right links. State regulators have reversed themselves on broadband telephone calling and ceded oversight to the federal government -- a move that critics fear will leave California customers with little recourse for poor or faulty service. "Little recourse"? Have these "critics" ever heard of switching phone service? Millions of Americans -- Californians included -- do it all the time. VOIP provider Vonage doesn't even make you sign a contract. I don't use VOIP, but I'm seriously considering switching to Vonage. I've been researching the pros and cons, and I believe I'm a big enough boy to take care of this decision with the California PUC watching my back. If I do go with Vonage and then decide it isn't for me, I can just switch back -- without trying to rouse some lethargic state bureaucracy to take action on behalf of little ol' me. Maybe some day, in the far future, these "critics" will finally discern the superiorioty of the free market over government in responding to peoples needs.